Tia Hilton has no interest in marriage or romance for herself. At the same time, she does love matchmaking and her annual Valentine’s Day ball. This year, she aims to find the perfect match for her beloved cousin Robert, Viscount Bainbridge. Robert has other ideas. He knows who his perfect match is already–Tia. If only he can persuade her that romance is not reserved for one day per year . . . Unfortunately, Tia’s ball ends on a sour note: she receives a black valentine, full of ill wishes. She attributes the card to one of her prior matches. Perhaps one of the couples is having marital difficulties and blames her? There’s nothing for it but to set out on a cross-country trip–chaperoned only by Robert–to each of her “matches'” homes in order to diagnose and treat their ills. Meanwhile, a secret society of bumbling Loyalists, the Black Masks, are involved in a complex plot to kidnap Thomas Paine. When the Radicals decide to foil the Black Masks by kidnapping their family members, Tia unknowingly becomes a target. Robert is the only one shielding her from the abductors nipping at her heels. Even as Robert tries to protect his cousin, their junket gives him a chance to convince Tia to look at him with new eyes. The sexual nature of their hosts’ various “marital difficulties” gives him ample opportunities to woo Tia, introducing her to the more sensual aspects of male-female relations. It seems a shame that the first review I am writing after such a long hiatus should be a pan, but Jones’s book is awful. Although it is conceived as a romantic comedy (and the Black Masks offer some entertainment), it is so unbelievable and poorly written that it is a chore to read. Indeed, I am dashing off this review now–despite the twenty other, better books I have piled up to write about–because I cannot finish Tia’s Valentine and have no desire to come back to it later. Some books are better put away as quickly as possible. I have a suspicion that romances based explicitly around a holiday theme must be especially hard to write. So much of the plot has to be forced. Here, Jones has created a plot-salad. Matchmaking. A secret admirer who must win his clueless parti. Secret societies. Abductions. Double agents. Thomas Paine. Thomas Paine? Jones’s book not only oversteps the bounds of period propriety, it demolishes them. Tia and Robert are unchaperoned and burst into each others’ bedrooms at will. Ok, it’s a comedy. Very well. I might have accepted that historical-rewrite if it weren’t for the other problems, which include horrible poetry, typos, “double entendres” that are so convoluted that it is impossible to figure out what the second meaning is, and so forth. In the past, when I’ve rated a book “Couldn’t Finish It,” I have actually finished the book but felt it was a total waste of my time. With Tia’s Valentine, I really am putting it down in the middle. 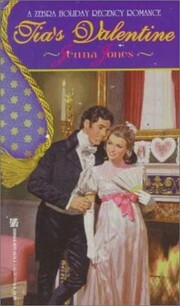 I hope the other Zebra Regency Romances are better.